In processing the lumber for my marquetry press, two of the shorter components ended up unusable. Too many nails. The simple solution would be to pick up some green construction lumber at the local yard. So I did. Cheap, fast, easy. 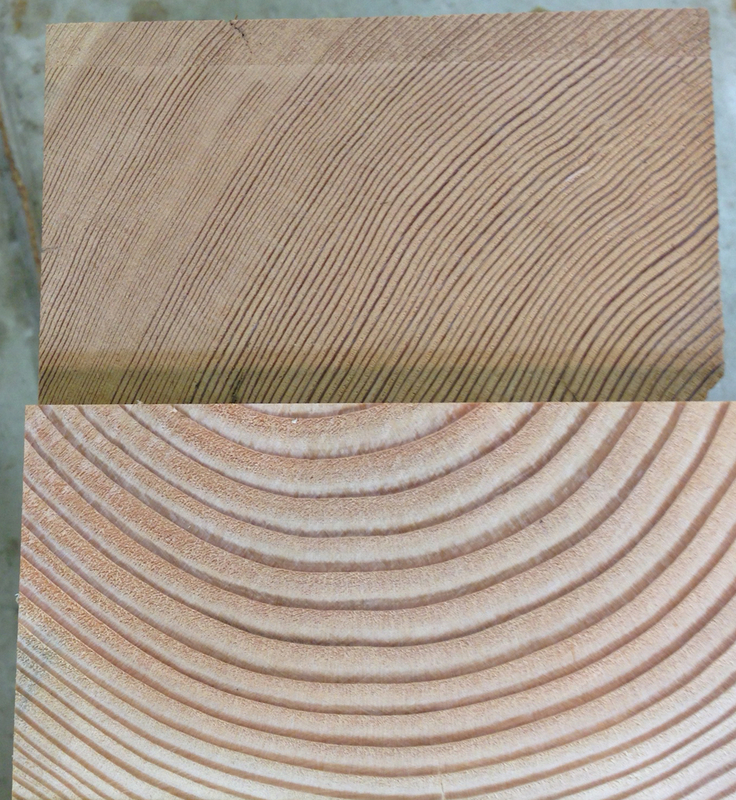 Check out the difference in growth rings. The reclaimed wood, from a 100 year old barn has fine, tight growth rings. While the piece I picked up today is very coarse and has less than 1/4 of the growth rings per inch. Old growth, fine-grained wood on top. New, green, fast growth on the bottom. I can probably use the new wood, but I don’t like the look of it. I’m going to try gluing up some of the scraps instead. That old growth stuff looks fantastic. Such is our lot in life. IMHO this is the main reason we have such difficulty in replicating techniques and furniture from the past. Thus we have to adapt our skills and methods to utilize the materials we have available to us in the present. Working with that old growth lumber will be an absolute joy I’m sure. Enjoy it! Glad your back at it too. Thanks Greg. The wood is really nice to work with, nails notwithstanding. I’m eager to get this project back on track too. Where’d the old growth timbers show up? I’ve been craigslisting for a while looking or old growth. The only commercial place I’ve seen is Heritage Lumber up in Petaluma. I’m in Pleasanton… looking for big wood for a workbench. I recently bought some 16′ 2×12 Doug-Fir with minimal knots at HD that had nice tight growth rings of about 100 years old tree like your old growth wood. So it is possible to get lucky, but you have to sort through a pile of heavy 2x12s, not an easy task. Despite all the nails and the condition of the wood, I’m going to keep an eye out for when people are remodeling homes, and try to salvage more of the stuff when I can. The stuff all goes into dumpsters now – trash as far as contractors are concerned. From the standpoint of strength, Oak and other ring porous lumber is stronger with fewer growth rings per inch, as in quick growing trees in open growing conditions. The weak area in those woods is the line between early and late growth in the season, the characteristic that makes them so easy to split along the grain. More growth rings per inch make them weaker, the opposite of the diffuse grain of Fir. That’s interesting, I would not have guessed that about Oak. Although now that you mention it, I recall a Woorwright episode where Roy said something similar about hickory. I choose this old fir because it was thick, dry and inexpensive (compared to buying new materials). I was a really nice surprise that it turned out to be pretty and nice to work with (once the nails and paint were out of the way). Old growth and a tight growth ring pattern should not be construed as synonymous. Agreed, although in this case I think the wood I used would meet the bar for “old growth” as it’s from a barn that was built over 100 years ago. I don’t doubt it Joe. I meant that new growth can have even comparably tight growth patterns.